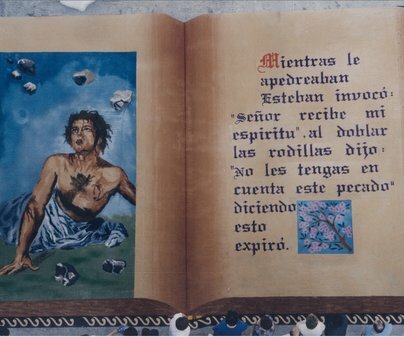 Elche de la Sierra is considered the birthplace of the sawdust carpet creations centered around the Feast of Corpus Christi. 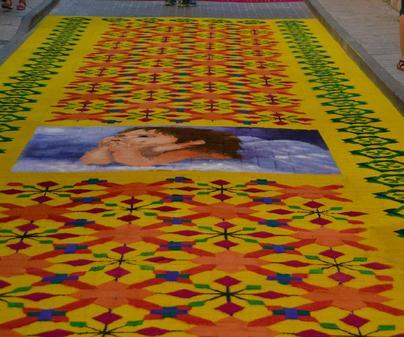 On the Saturday before the feast, three squares and twenty-seven street sections are converted into real-life canvases upon which thirty carpets will appear - colorful compositions that alternate between religious scenes and geometric figures. 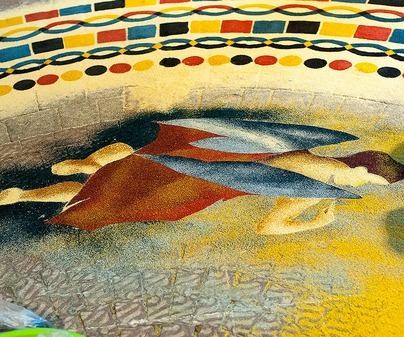 They will barely last three hours, and they will be destroyed with the passing of the Corpus procession, but the thirty groups of carpet-artists will have been preparing for months prior. 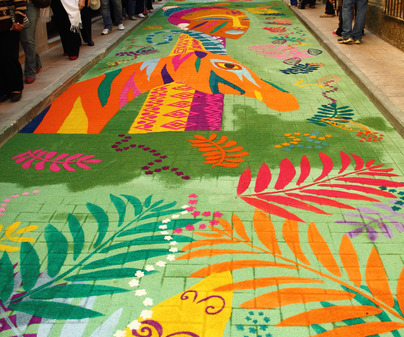 Competing for the honor of the most impressive carpet creation, their designs garner more spectacularity with each year. 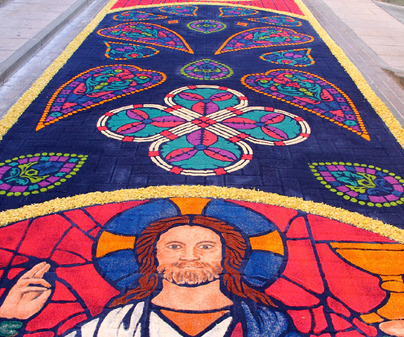 The festival has earned the distinction of National Touristic Interest, and it is connected to a millennial tradition, based on the reception of Jesus Christ in Jerusalem. 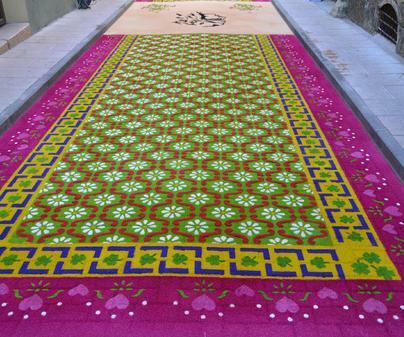 During the Golden Age, the tradition of the creation of carpets made of flowers still survived, although now the practice has mostly disappeared. 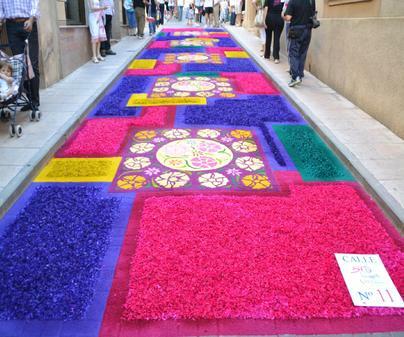 In fact, the originator of the tradition in Elche de la Sierra, Francisco Carcelén, got the idea from a trip to Tarrasa, seeing there the creation of a carpet made of flower petals for the festival of the octave of Corpus. 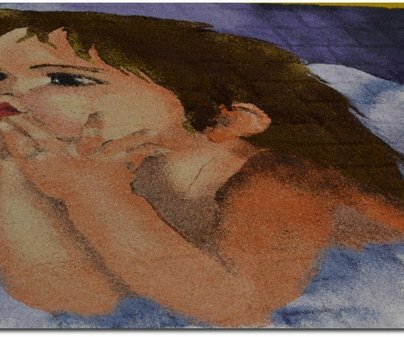 In 1964, and in absolute secrecy, Carcelén dyed sawdust shavings and, helped by twelve young men, created the first sawdust carpets. 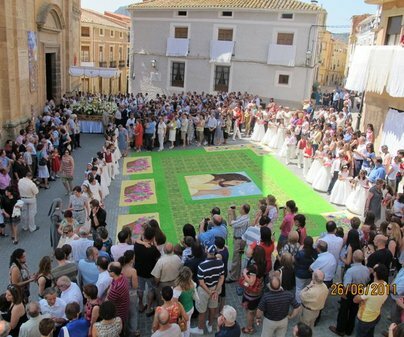 The surprise during the Corpus procession the next day was so well received that since then not only have they continued with the elaboration of these carpets, but it has given rise to a cultural tradition of the highest class. 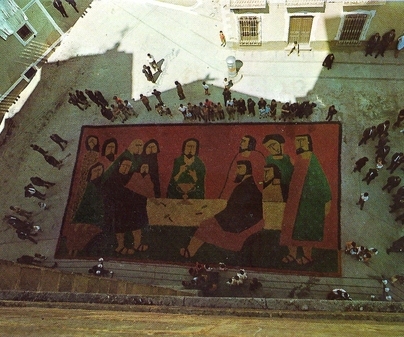 Throughout the tradition’s development, the Galera brothers had special importance when, in 1965, they created a cubist-style carpet of “The Last Supper” in the Plaza de la Iglesia, and the so-called “Christ of the Fried Egg”. These images marked the beginning of a competition amongst neighbors to create more and more artistic compositions. 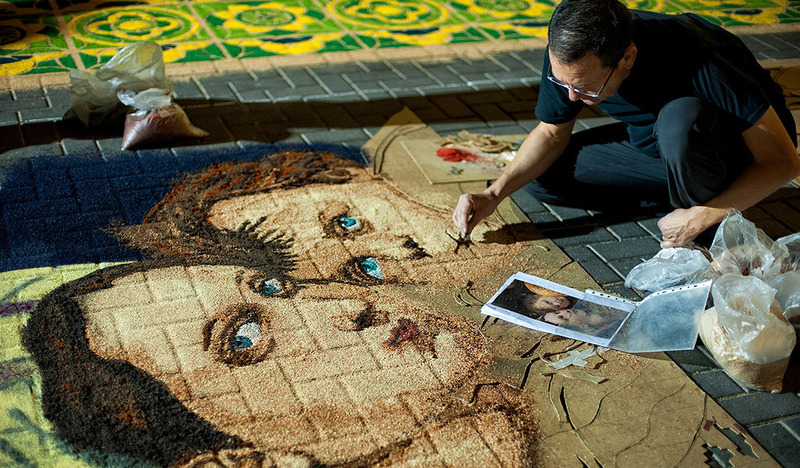 In the 70s and 80s the tradition established itself firmly, until arriving at its current point, with clubs of carpet artists and their months-long preparations. 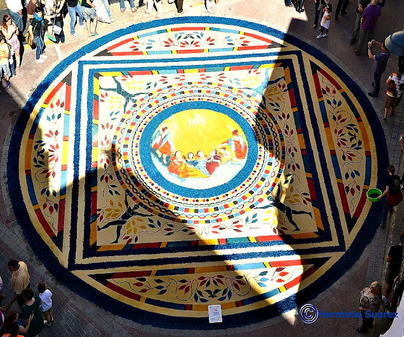 The sawdust carpets of Elche de la Sierra must have existed prior to its revival in 1964, given that the tradition was taken to the Americas by the conquistadors. 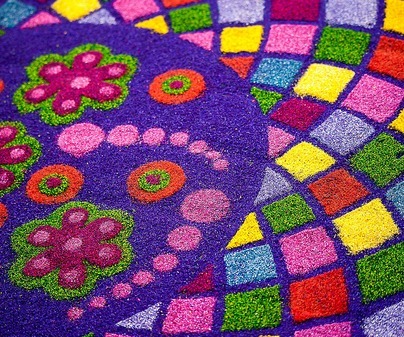 Currently, many places in Guatemala also produce these types of dyed sawdust carpets. Festival of National Touristic Interest. Varies. The night before the feast of Corpus Christi. 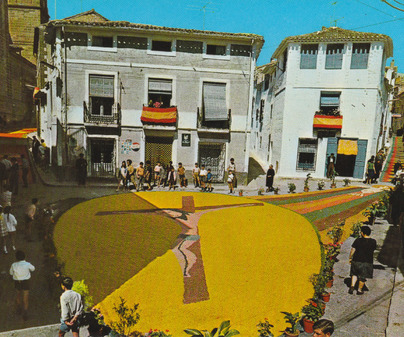 The Saturday afternoon/evening before the Corpus Christi procession allows one to wander through Elche de la Sierra and appreciate not only the finished carpets, but the creation process itself.